It is with much sadness that the board of directors and staff mourn the loss of Brian Hill, who passed away suddenly on July 24 while at work in Quesnel. Brian served the position of president for Ownership Identification Inc. since September 2005 as he also represented the BC Breeders and Feeders Association shareholders group on the OII board. We will sorrowfully miss Brian’s livestock industry knowledge, experience and leadership. Brian and Sharon Hill worked closely in a husband / wife partnership during Brian’s livestock order buying days and most recently managing the Sears Store in Quesnel together. Sharon and the family have asked for those so inclined to please make a donation to the Heart and Stroke Foundation in honor of Brian Hill. Vice President, Ellen Hockley represents the BC Horse Council on the OII board and will serve as in term President. The 2008 Annual General Meeting will be held on Wednesday, October 1 in Kamloops. Everyone is welcome to attend. OII staff members Jan Canart, Kelli Pozzobon and Bob Miller attended and participated at the BCCA agm in 100 Mile House with a display booth in the Trade Show. The display booth offered an array of photo’s and handout information regarding brand inspection service, applications and transfers, reminder information on proper use and completion of manifest’s as well as brand books, which are available to the general public. Several OII board members and brand inspectors were in attendance and stopped by the booth to answer industry related questions and visit with fellow cattleman. We have updated our web page with new pics and a News Release section, which we intend to keep current as an electronic news source. When visiting Kamloops, we invite everyone to stop by the office and acquaint yourself with the OII staff. The office is located in the Terazan Gas building, 102 McGill Road and can sometimes be hard to find, as it is in the back of the building. We are here and encourage your visit. OII currently employs 35 part time brand inspectors located throughout the prescribed areas of the province with one serving industry needs in the non-prescribed area. In a recent report identifying inspection activity, it came as no surprise to recognize our inspection numbers have been decreasing. For example, during a year to year comparison for 2006-07 to 2007-08 numbers remained virtually the same in the Kootenay region, slightly down in Kamloops and North Okanagan areas, a slight increase in the South Okanagan, but a continued downward trend in the Caribou, Central Interior, Peace and non prescribed areas. It was 1997 when Ownership Identification Inc was designated by the Ministry of Agriculture, Food and Fisheries to administer a brand registration and inspection program in British Columbia. In the fall of 2007 the following brand inspectors were recognized for 10 years of service with the organization. Peace River Area: Al Hollingshead and Raoul Deprez, Central - Interior Area: Harold Kerr, Jon Ziler, Carol Imus, Reg Marek, Caribou Area: Jon Herrick, Len Ablitt, Neil Morrison and Jim Leppard, Kamloops-Okanagan Areas: Bev Baker, Rick Davidson, Ken Devick and Art Harfman, Kootenay Area: Jerry Thibault, Michelle Musil, Charles Moon and Russel Bolen. Most recently Owen Thomas, Williams Lake area inspector has surpassed this milestone. The 2008 brand books will be available in September and promises a new look, highlighted by a fantastic front cover photo, graciously provided by Liz Twan of Alkali Lake. Effective immediately, OII inspectors will be required to use a new manifest (form 3) book for BC cattle moving to Alberta. 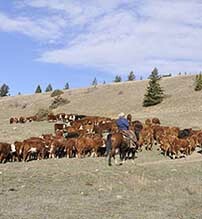 The Alberta Livestock Identification and Commerce Act Section 15 finalized proclamation states "Where livestock is being transported for the purpose of sale, the owner of the livestock shall ensure that the name of the holder of any security interest in the livestock is disclosed on the livestock manifest." In accordance with this regulation change, OII has produced a new manifest book to include a "Financial Declaration" column on the document and must be completed and accompany the livestock to the Alberta market. 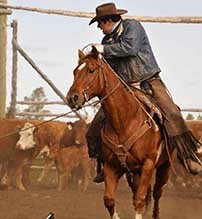 If this portion of the document is not properly completed and does not accompany the shipment of livestock from BC to Alberta, payment for the livestock may be delayed, until the Alberta market receives such "Financial Declaration"
Please note, this declaration requirement only affects livestock that are marketed to Alberta. As mentioned Ownership Identification Inc provide and serve the industry in the areas of livestock brand inspections and brand registrations, since administered by the ministry in 1997. Everyone employed and associated with our company take pride in their roles, exhibiting due diligence and professionalism on a regular basis. As a directive from the General Managers chair, newly appointed Bob Miller states "We want to be recognized and respected as an industry partner, working together with livestock producers, related associations, auction market and slaughterhouse facilities, livestock transportation companies, the RCMP and Interior Health meat inspections, in an attempt to deliver the most reliable and economical service we can in today’s times. We understand the daily challenges that today’s livestock producers and industry related partner’s are confronted with and not unlike how we want to provide our service. At OII we want to conduct our business in a common sense and yet economically viable manner. Therefore, we are reminding our inspectors to practice time and mileage management while arranging and performing their duties." Likewise, a reminder to producers as we head into what is projected to be a busy fall run, to have properly completed manifests accompany their shipments with special attention to proper completion of the ownership section. This must be completed exactly as the brand on the animal is registered unless a bill of sale is presented at the time of inspection to verify a change of ownership. It is not the brand inspector’s responsibility to fill out your manifest for you. Incorrectly completed manifests could result in the funds being detained until proof of ownership has been confirmed.